A little more than six months ago, I took a new role with a group that was described as in need of a “turn-around” and an “updated strategy and direction”. I was urged to introduce a new mission/vision, strategic objectives, and revised key performance indicators. Given my performance management background, this seemed like a reasonable approach. My first few weeks on the job reinforced my initial assessment. Almost every important decision had to be made by me personally. At first I assumed this was because individual employees had little understanding of the company strategy. However, it quickly became apparent that cascading the strategy was unlikely to help because everyone was used to delegating up. After a couple of years of being told what to do and being discouraged to think for themselves, my new group had a culture problem. A 2005 Harvard Business Review study of more than 100 corporations and thousands of executive assessments showed that culture influences leadership style more than any other factor. Regardless of job function, employees who work in the same organization are 30% more likely to exhibit similar leadership styles than people who do the same job but work in different companies. Even strong leaders are susceptible to learned helplessness. In my experience a well-designed and well-implemented strategy cannot be effective unless people are motivated to support it. This idea is captured by the mantra “culture eats strategy for breakfast”, popularized during Mark Fields tenure at Ford Motor. Clearly culture was my job one. Of course, none of this was without some drawbacks. Not all of the decisions were consistent with my point of view. And I missed some chances to put my own imprint on the group. But the benefits more than outweighed these downsides. Today, the difference is palatable. The team is energized, employees are more engaged, and performance is improving. What’s more, there’s a sense of teamwork that didn’t exist before. Goals, initiatives, and metrics. I have a huge appetite for strategy management. But I shouldn’t forget that breakfast is the most important meal of the day – it all starts with culture. This entry was posted on Sunday, May 23rd, 2010 at 9:12 pm and is filed under "performance management", "strategy management", alignment, cascade, leadership, management by walking around, metrics, strategy. You can follow any responses to this entry through the RSS 2.0 feed. You can leave a response, or trackback from your own site. great post. looking forward to seeing this philosophy go across the organization. Another good example of Responsibility vs Accountability. When someone is engaged and motivated they will take responsibility and move things forward, often beyond expectations. Accountability so often means having someone to blame. In cultures like that people want to live in the shadows and delegate up as much as possible. When people are given, and take, responsibility they don’t mind living in the sunshine, even if it means an occasional sunburn. Great post and very consistent with the research from my book, drive business performance. Culture eats strategy for lunch, breakfast and dinner. 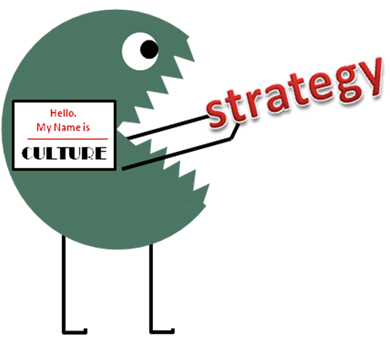 However, Culture is not a substitute for Strategy. Our observations has been that leading organizations have a sound strategy and a culture that re-inforces it. Happy to know about your changing culture success story. I hope more and more organizations will take your experience as a model to follow. Bruno (and others who sent me emails), I didn’t mean to imply that Culture was a substitute for Strategy. Indeed they serve different purposes. Instead I observe that sometimes we rush to change the Strategy without realizing that the Culture won’t support it. You gotta have both. The current, the rhythm and the heart is culture! Very good viewpoint — plausible description. There is the opposite problem: excessive delegation. I’m currently working for a company which takes “employee empowerment” to extremes. What I mean by that is that the top management often seems to be following the “management by absence” book. They delegate strategic decision to first- and second-level technicians who find themselves free to decide which technology will be used without caring for the long-term implications or if those decision will even fit the company strategy. And besides delegating strategic decisions they also don’t make their vision known to the whole company (if they ever had one). It’s all very Web 2.0 and “cool” company. You should write a business strategy book, Jonathan. Your personal stories, like this one, really drive home important management points. Thanks Chad. I would like to but haven’t had the time to focus on it. can i use your image in my PPT?? culture and strategy are compliments , they should always be in tandem.